Use the Heat Tool to dry the Whisper White Craft Ink on the houses before die-cutting them, or just use the White StazOn ink pad instead. If your ribbon doesn't stay in place, pick up a Mini Glue Dot from the roll with your Paper Snips, and tuck it under the knot. Then stick the knot down where you'd like it to stay. If you're mailing this card, pull that knot as TIGHT as you can, to keep it as flat as possible--to avoid the need for extra postage due to thickness. 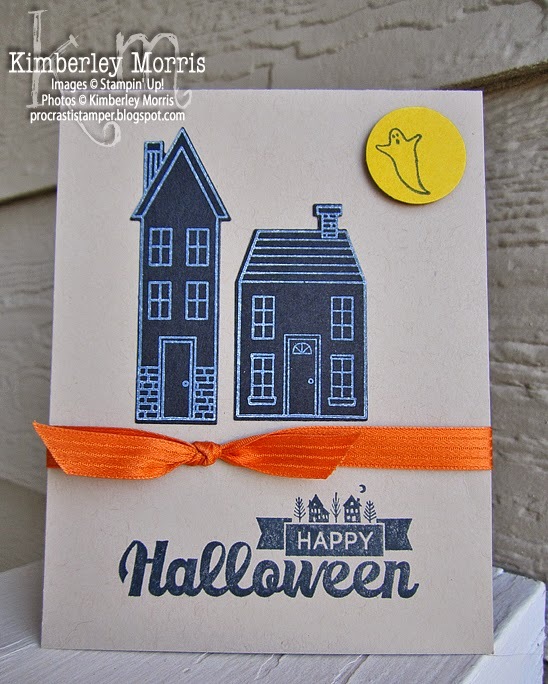 In same scenario as above, adhere houses with flat glue, using a Stampin' Dimensional only for the moon. 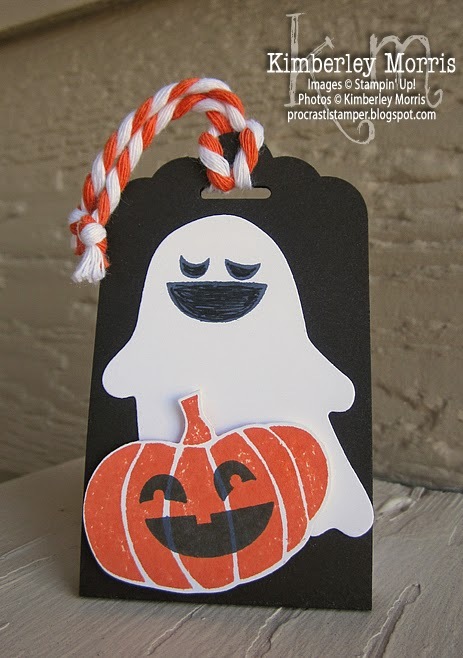 Yet another CUTE, and not CREEPY, Halloween Project! 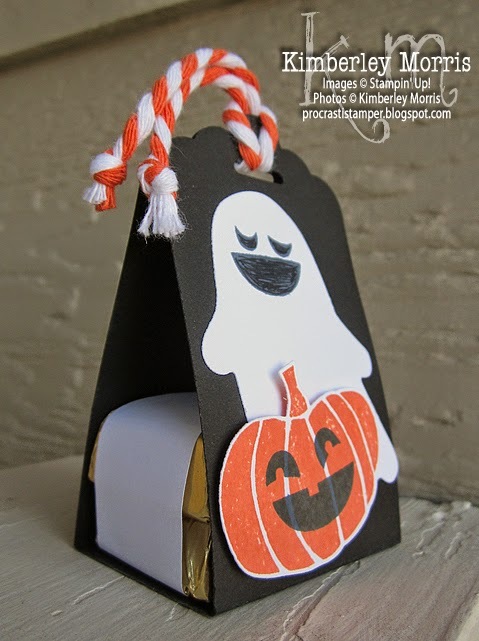 To assemble this treat holder, cut a piece of Basic Black card stock to 2" x 8-1/2". 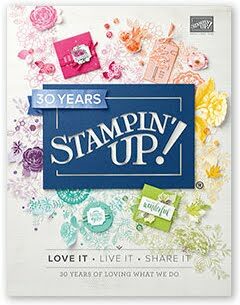 Score 3-1/2" in from each end, then punch each end with the Scalloped Tag Topper Punch. Fold up each end, and hold together with Tangerine/White Two-Tone Trim. As you can see in the samples, I like to knot the ends of the trim so they don't fray. Stamp and die cut the images for the front, and adhere ghost with Fast Fuse adhesive, then adhere jack-o-lantern with a Stampin' Dimensional. There are 4 Hershey Nuggets inside the treat holder, they are stacked 2 on 2, then wrapped in a strip of copy paper that's about 1" x 7". (you could use Designer Series Paper if you have it, but the white paper goes well with the ghost theme) It may help you to use SNAIL to stack the Nuggets while you wrap them. I line them up at the end of the strip and hold them in place SNAIL, then close the strip at the bottom with more SNAIL, as shown in the pictures below. If you want to encourage easy removal of the treats, without damage to the holder, just slide the whole bundle into the center of the holder, and let gravity and friction hold it in place. 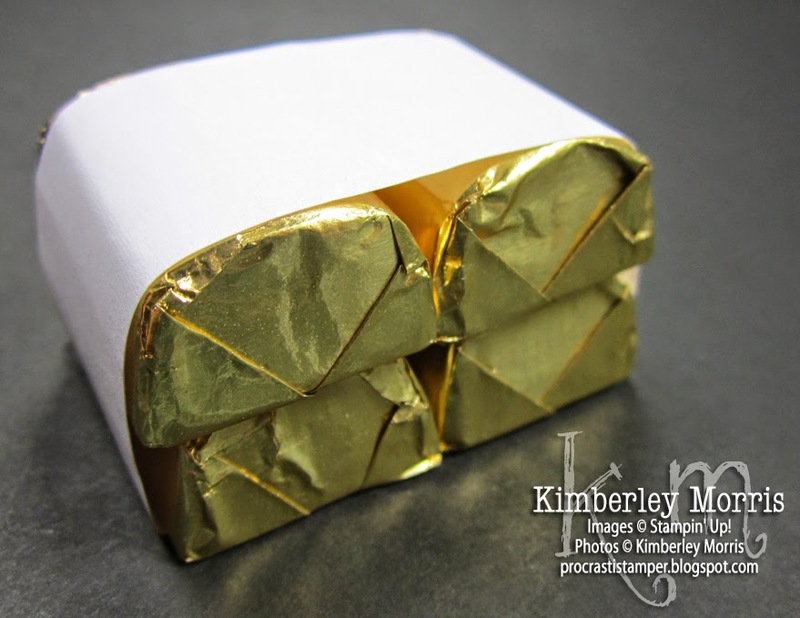 If you are going to handle these a lot, or think the recipient might, you may want to put a dot or two of adhesive on the bottom of the bundled chocolates, then press the bundle into place in the holder. 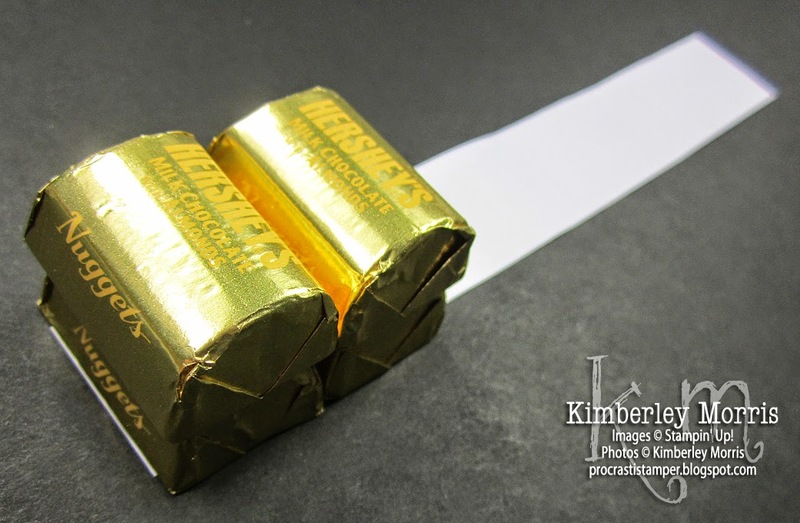 This should keep the bundle from sliding out, but be aware that the holder is more easily torn in the removing of the chocolates with this method. Enjoy sharing this CUTE, not CREEPY, Halloween Treat!